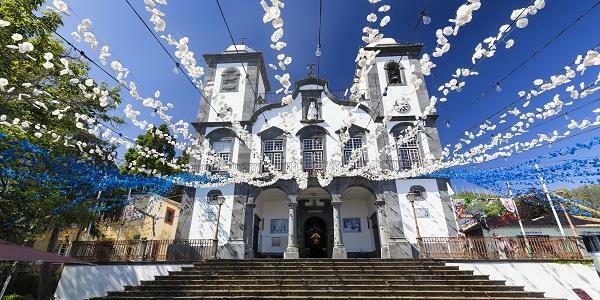 6 km from Funchal, you’ll find the small yet beautiful parish of Monte. Perched on top of the hills and overlooking all the hustle and bustle, it was once a health resort for Europe’s upper classes. It’s easy to see why it was so sought after – the beautiful views over Funchal city and the bay are unmatched, and keep surprising you as you stroll through these charming streets. You can reach Monte by car. It’s around a 25-minute drive from Encosta Cabo Girão, and there’s several car parks around the town. Alternatively, you can add an extra element to your visit by taking the cable car from Funchal. 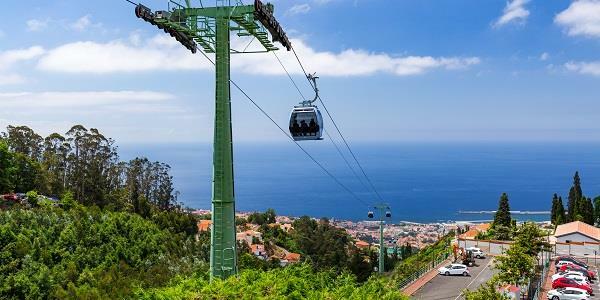 This will carry you all the way up to Monte in about 15 minutes, during which you can enjoy the spectacular views of Funchal bay from one of the 39 seven-seater cars. It costs around €16 for an adult return ticket, and €8 for a child. Find more information here. Conveniently, the cable car station stops very close to the entrance of one of Monte’s main attractions. In 1987, Jose Berardo, a Portuguese businessman, bought an abandoned property just outside Funchal. 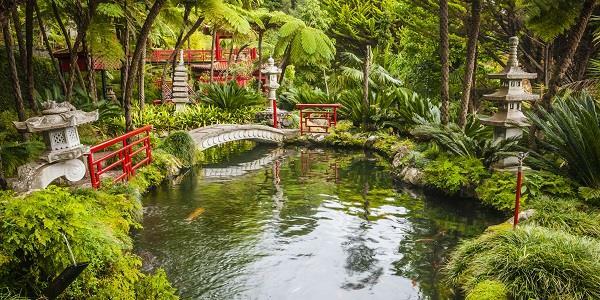 He converted the 70 acres into a spectacular garden – the Monte Palace Tropical Garden. Today it is open to the public, and perhaps one of the most beautiful gardens in the region. And that’s especially impressive, when you consider that the island’s floral heritage has caused it to be referred to as the ‘floating flowerpot’. A visit to the Monte Palace Tropical gardens takes a minimum 2 hours (although don’t be surprised if you find yourself lingering for much longer! ), and provides opportunity for guests to discover fauna and flora from around the world. With beautiful blooms, lush greenery, dazzling water features and plenty of other botanical surprises, it’s a haven for any green-fingered visitors to Madeira. In addition, you’ll find some beautiful examples of glazed tiles hidden throughout the garden. These stunning azulejo panels show the history of Portugal, all creatively painted in bright colours and shapes. As well as these, you can find works of art, decorative ceramics and breathtaking sculptures nestled amongst the flowers. Part of the beauty of the gardens is you never know what’s around the next corner! On top of all this, the Monte Palace Tropical gardens also contains two oriental gardens, an old luxury hotel and a museum containing African stone sculptures and a fascinating collection of minerals – plenty for the whole family to enjoy! The garden is open daily between 9.30 am and 6 pm. The entrance fee is €10 per person and children under 15 are free. Not far from the gardens, Nossa Senhora do Monte Church was initially the site of a primitive chapel built in 1470 by Adão Gonçalves Ferreira, the first man born in Madeira. The first stone of the current church was laid in 1741. However, a few months after its completion, the church was seriously damaged by an earthquake in 1748, after which it had to be rebuilt. Our Church of Our Lady of Monte was finally finished and consecrated in 1818, and is now one of the most important pilgrimage sites in Madeira. The church contains a whole host of beautiful and fascinating details, including spectacular chandeliers, beautiful gold and silverwork dating all the way back as the 17th Century, and an ancient statue of Our Lady of Monte. The church is also the final resting place of Emperor Charles I of Austria, who died in exile on Madeira, and a statue of whom can be found in the church’s atrium. On the 15th of August each year, processions honouring Our Lady of Monte, the patron saint of Funchal, take place here. It’s known as one of the biggest and liveliest religious events on the island, and brings the whole neighbourhood together to celebrate. The highest of the municipal Parks, Leite Monteiro Park (Monte Municipal Park) lies between 543 and 586 metres above sea level. It covers an impressive 26,000 m2, and was built between 1894 and 1899. The garden contains many exotic and indigenous species, including some centuries old trees. There’s a stream which runs through the garden, ending in a waterfall at the southernmost area of the park. It’s free to visit, and contains plenty of walkways which are perfect for a gentle afternoon stroll. You can easily imagine the aristocrats enjoying the very same garden during their extravagant holiday visits! Once you’re done with Monte, why not make the return journey to Funchal in style with a ride in a Monte Sledge? One of Madeira’s most famous attractions, the sledges are made of wicker and wood and contain two seats each. 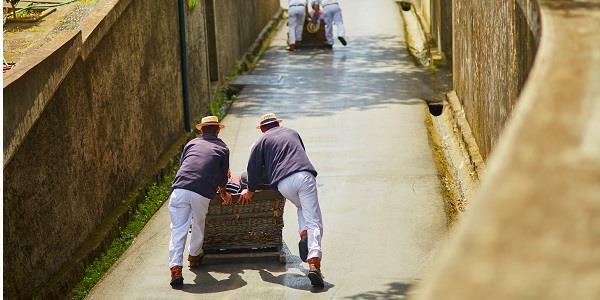 These sledges are powered by two carreiros (sledge drivers) wearing white uniforms and straw hats, who control the baskets by using their boots as brakes. You’ll go barrelling down the sloping streets, catching glimpses of the magnificent view as you enjoy an exhilarating ride the whole way back to Funchal. Please note that the baskets do not take you all the way to the bottom of the hill, so you may need to get a taxi or take a walk back to your car. With this final exciting ride back down the slope, you’re perfectly located to return to the beautiful Encosta Cabo Girão. With 120 holiday properties, panoramic sea views, swimming pools and much more, it’s the perfect place to sit back and relax after a long day exploring. To learn more about Encosta Cabo Girão, as well as how you can stay in our other properties across the UK and Europe, simply request a brochure.